Because when it is flipping cold up here in Detroit Lakes, what else are you going to do? The new season starts tonight. I got upgraded to a new team, and the competition will be stronger. I'll be throwing second, which isn't that dissimilar to the #2 hitter in a baseball lineup. This will be keeping me busy for every Wednesday all the way to March. I hope my game, and my liver, are up for it. What else are you going to do in Detroit Lakes when it's flipping cold? What are the odds of this? Let's do some math! Total chance of this happening - 1.33%! Lots to give thanks for, indeed! As Thanksgiving comes to a close and the last of leftovers find their demise, there's still a glow of thankfulness they impart. The blessings of having more than enough to eat are an obvious one, but they also allude to the friends and family that have gathered around us to partake in the incredible bounty. 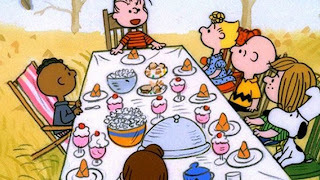 The feast leads to conversations - an engagement that happens all too infrequently in our hyper-connected and hyper-scheduled days. The feast also leads to physiological impacts as well; mainly in the form of naps! However, they're not just naps induced by a full belly. They're naps also fueled by the contentment of a heart that is equally as full. As the last of your feast gets consumed and space finally opens back up in your refrigerator, my fervent hope is that the meals those leftovers afforded provided you all with something far greater than just something good to eat. This one's for you, Kent. Wish I would have been able to see you play this. "Each of us has her or his own list of items for which to be thankful. We can start at the outer edges of this vast universe or begin in the depths of our own being. Either way, our life, our existence is a fabric of gifts, items whose origin was not our doing. Especially those of us in relatively good health, living a comfortable existence in a much-blessed country, have no excuse for whining and complaining. As the chronically ill and the poor so often teach us to our embarrassment, there are so many things, so many people, so many events for which we should be thankful. We'd do well to list for ourselves all the gifts that make our life so livable -- and more." We can and do audit our pains, slights, and times where we had to suffer indignity or unfairness. However, if we chose to audit our blessings in addition, the ledger it'd create would be embarrassing. We have been deeply blessed - all of us. Let's take some time today to truly be cognizant of it, and thankful for it. As we slide into Thanksgiving, if you need something to be thankful for, be thankful that you and your family don't live on the Red Lake reservation. "Anybody that underestimates the power of Catholic education to change lives is a damned fool." And that is one glaring reason, of many, why the Catholic Church matters. My buddy and partner, Kent, at the duck camp died. I went to camp on a Saturday morning to do some chores and hunt some pheasants, and when I arrived one of my partners told me Kent had died the preceding morning. The news was like a punch to the gut. Kent had not been around much this hunting season, and I sensed something was wrong with him. That week, I had made a note a couple of times to myself that when I freed up I needed to call him and ensure he'd be at camp this weekend. I also wanted to let him know I was there for him. I didn't call. I wasn't there for him. We don't know how he died, nor does it matter to me. All that matters is that we've lost our 4th partner of the camp. Somebody I've hunted with for over 40 years. Somebody with a grin that lit up a room. Somebody that could fix damn near anything. What happens now with the camp is anyone's guess. We're still not resolved from Bach's death over a year ago, and now this. It's going to be a huge mess. But, ultimately, that doesn't register, because buddy and partner, Kent, at the duck camp died. I can't convey enough how much I will miss him. Hi YDP Nation. It has been over a month, but I'm back. So what happened? Folks, I was tapped out. Between the church scandals, the Kavanaugh hearings, the violence - I simply felt like I didn't have a foundation. My church and my country were ugly things. No, they've not gotten much better. But I have. I'm at a place where it's time to start putting down some markers on what I believe is important, and I need to start being the one responsible for taking things in a new direction. As it has in the past, this little blog will continue to serve as my small little shout at the rest of the world. Sorry for the absence. A lot has happened, and I'll be telling you all about it. But in the meantime, let's just try and be decent to each other.